Go Medieval This New Year’s Eve! How about something a bit medieval this New Year’s Eve (and get a large discount because you are a Greer’s OC reader)? Celebrate the evening at Medieval Times in Buena Park. The 9:30 p.m. spectacular includes pre-show hors d’ oeuvres, admission to the Museum of Torture, two-hour live show, four-course feast, party favors, DJ and dancing, champagne toast at midnight, balloon drop and continental breakfast. Tickets only $50 for Greer’s subscribers (normally $69.99 adults). Child tickets are only $35.95. (All tickets plus tax and processing fee.) Purchase online or call 1-888-935-6878. Must enter/mention code 50GOC9 when booking to receive your discount. 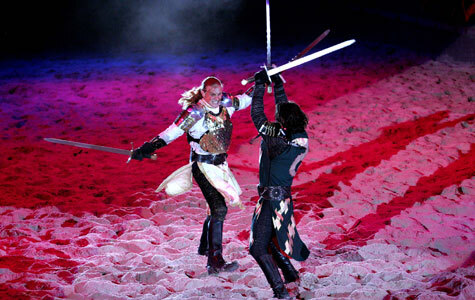 Medieval Times Dinner & Tournament is at 7662 Beach Blvd. in Buena Park. Want to attend a New Year’s bash that’s done right? Ring in 2010 at the five-diamond St. Regis Monarch Beach with celebrations, gyrations and, of course, libations. The party, “Seduced in the OC New Year’s Eve” is back for “Part Deux” and promises to be hotter than ever. After selecting from an array of irresistible dining options, you can party and dance the night away. $95 per person for party admission (special room rates available). For reservations, log on to stregismb.com. One Monarch Beach Resort in Dana Point. 949.234.3200.